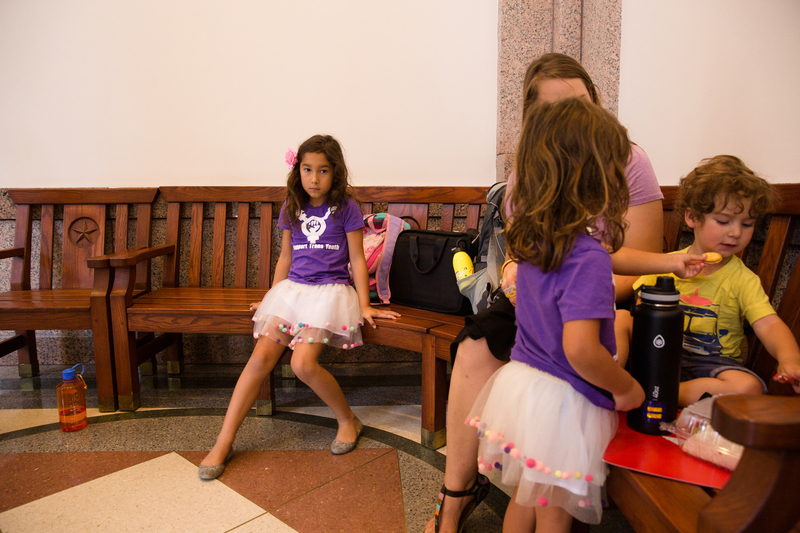 They were unlikely to sway a committee of Republicans considering bathroom restrictions for transgender Texans, but a transgender 7-year-old and her mother waited for their two minutes. The doors of the Texas Capitol had been open for just about 40 minutes when Rachel Gonzales made her way down into the lowest level of the pink granite building and joined a very long line. 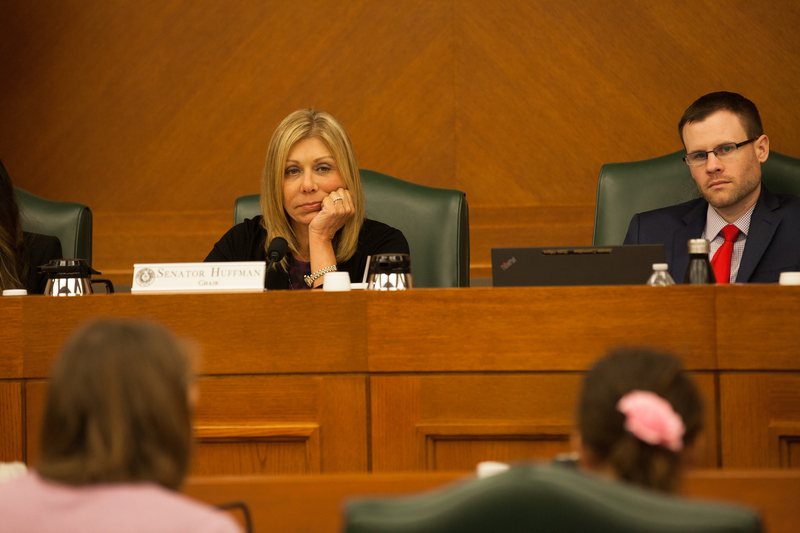 Just like the state lawmakers who were back in Austin for the summer, Rachel and her 7-year-old daughter Libby had some unfinished business to address. For the third time this year, lawmakers were set to consider proposals to restrict bathroom use for transgender men, women and children. 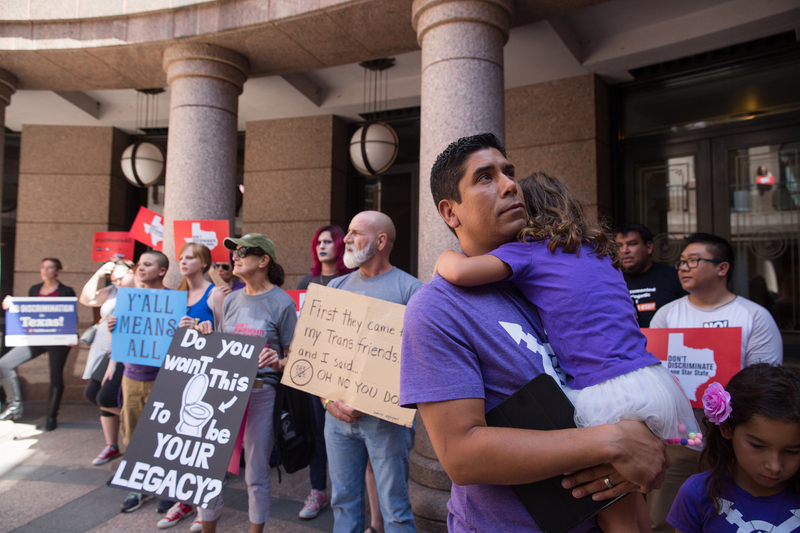 For the third time this year, hundreds of Texans — most of whom opposed any sort of restrictions — had descended upon the Capitol to speak before lawmakers. And for the third time this year, the Gonzales family was joining them, hoping to explain to the committee why those policies would be deeply detrimental to Libby, who is transgender. The first two times hadn’t ended exactly how they had envisioned. “I don’t even remember what I said,” Rachel Gonzales said on Friday morning, recalling the first time she got just a few moments to make her case to a panel of state senators — the same panel she was standing in line to address now. 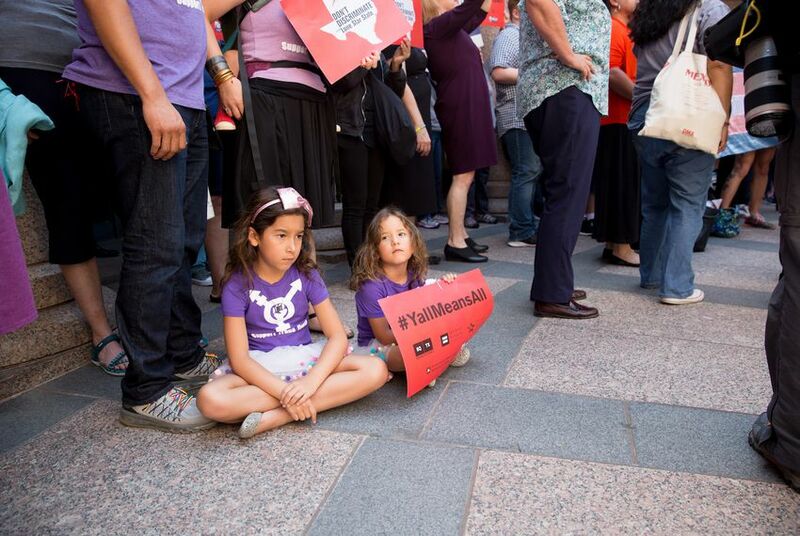 During the first legislative hearing to consider bathroom restrictions in March, Gonzales had been at the witness table while Republican members of the Senate State Affairs Committee took turns aggressively questioning a representative of the Texas Association of Business, which has long opposed any type of bathroom bill. The 40-minute admonishment was so heated that the committee chair suggested Gonzales and the other witnesses should leave the table until they were done. Gonzales — already nervous and emotional over having to publicly defend her daughter — was rattled and left the room disappointed she couldn’t deliver a clear message to lawmakers. When House lawmakers held their own hearing in April, it was Libby who left unhappy. Once again, the family had driven from Dallas and waited for hours to testify but they weren’t called up until almost 2 a.m. By then, Libby, who had prepared a short speech, had fallen asleep. Her father Frank balanced her sleeping figure in his arms while he pleaded with lawmakers to not put her in danger by forcing her to use the men's restrooms. On Friday, the family wasn't happy to be back at the Capitol — it meant lawmakers were still considering limiting bathroom use based on what is on a person’s birth certificate. After similar efforts fizzled out during the regular legislative session that concluded in May, Gov. Greg Abbott put them on the agenda for a 30-day special session that began Tuesday. Driven by Lt. Gov. Dan Patrick — who forced the legislative overtime, in part, to revive the failed bathroom proposals — the Senate was moving quickly to approve the legislation. So quickly that the Gonzales family was forced to delay their planned family vacation to the beach and reroute to Austin. Perhaps this was all another exercise in futility. No matter how many hours of testimony they listened to, the committee would most likely approve the measure later that day. But the Gonzaleses were determined to get their two minutes each. “I felt like I was going to have a panic attack,” Frank Gonzales said of being back at the Capitol. Nearby, his two daughters picked out snacks from a fold-out table in a makeshift hospitality room meant to offer a safe haven to dozens of families who came to oppose the Senate’s proposed bathroom restrictions. His family is part of a growing network of families of transgender children who, as they tell it, were galvanized to become advocates and activists when lawmakers in Austin decided the state should play a role in where their children go to the bathroom. Over the last several months, it’s meant requesting days off from work to make the trip to Austin, dealing with the online harassment that often follows their public testimony or interviews with the press, and — on days like today — waiting hours to speak to Republican lawmakers who have already made up their minds. Social conservatives have pitched the bathroom restrictions for a variety of reasons: privacy concerns, avoiding what they describe as the blending of genders, or to dissuade sexual predators from taking advantage of trans-inclusive bathrooms policies — a point for which they’ve provided virtually no evidence. The emotional toll of all that was visible on Frank’s face as he stood in the middle of the Capitol’s outdoor rotunda during a midday rally and explained to the crowd gathered around him that his family was “tired and fed up,” that lawmakers had “underestimated the lengths a parent will go to protect their child” and that they needed to be called out for putting his child in harm’s way. Back inside the Capitol, Frank was back to his soft-spoken nature, explaining that so many other parents and transgender people, young and old, can’t make it to the Capitol to make their voices heard. He expresses regret about how long it took him to get over the preconceived notions he had of his child. Now, he said, his family has become a support system for other transgender individuals whose own kin haven’t been as understanding. Perhaps that’s why they keep showing up. After a quick lunch, the family is in a committee room that’s being used as a sort of holding room for those waiting to testify before lawmakers. Frank makes camp in a corner with Libby and Cecilia while Rachel — wearing her sleeping 2-year-old, Henry, on her back — heads to their hotel to check out. Frank, who had said he was running on caffeine and adrenaline, stands up and tells the man to stop talking to him. The man turns back around and ignores him. Frank is much calmer when Rachel returns from the hotel. They talk to friends out in the hall who lift their spirits and laugh about not “feeding the trolls.” They decide to instead wait on a bench outside the holding room. Inside the hearing room, a transgender man questions the committee about why they would want him in the same bathroom as their daughters. An elementary-aged transgender girl recalls a time she was required to use the boy’s restrooms only to have a boy hop on the top of the stall and watch her. Others point out the tragically high rates of suicide among transgender youth and how a bathroom bill could perpetuate that. The Gonzales kids split a packet of crackers as the committee inches toward their places on the witness list. About an hour later, they return to the holding room to get organized before heading into the committee room. “Can we talk about whether you’re going to testify?” Rachel prodded lightly. “I’m scared,” Libby responded in a quiet voice with a shrug of her small shoulders. While she’s giggly and playful around her siblings, she’s extremely shy around people she doesn’t know. “It’s OK to be scared,” Rachel said, running her hand through Libby’s chestnut curls. Almost seven hours after Rachel first walked into Capitol, she ushered her family into the committee room. The family — wearing matching purple shirts emblazoned with white letters that read “protect trans youth” — headed toward four empty seats in the back of the room. There were still a few witnesses ahead of them. Libby held her testimony — written out on a sheet of white paper that was also covered in scribbles — straight in front of her as she fidgeted in her seat. Lawmakers were calling up witnesses four or five at a time as they zipped through their testimony. Then it was their turn. Libby, Rachel and Frank took their seats at the witness table. Her head barely clearing the top of the green chair, Libby looked down at her testimony. She suddenly appeared a bit older as she adjusted the microphone in front of her and placed her fingers on her temples to concentrate. Knowing how Libby could shut down in front of strangers, her mother wasn’t sure she would go through with it. But when her name was called, Libby leaned toward the microphone. After Frank testified, it was Rachel’s turn. But this time she hadn’t prepared anything to say. She told lawmakers she hoped they understood how serious they were about fighting for their child and how she hoped they would do the same for theirs. “Please, please keep in mind that we need to keep every single child in this state safe,” Rachel concluded. The family rushed out of the room after a short thank you from the committee. They had spoken for barely six minutes of an almost 11-hour hearing. The nerves Libby had managed to contain were finally making an appearance as she shook her arms out and turned to her father, who got down on his knees and enveloped her in a tight hug. Her body instantly relaxed in his arms as he whispered an “I love you” in her ear. It was a moment of triumph for the family, though it was short-lived. The committee went on to vote the measure out hours after the Gonzales family had left the Capitol. But at least they had gotten their two minutes. Disclosure: The Texas Association of Business has been a financial supporter of The Texas Tribune. A complete list of Tribune donors and sponsors is available here.